Over the weekend, I came across a post from fellow Age of Conversation 2 contributer Chris Kieff which contained a wonderful video from Charles Leadbeater, a well known leader in the innovation and creativity space. 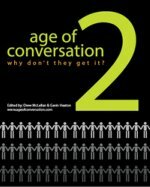 As Chris points out, the video does a great job explaining one of the key concepts behind The Age of Conversation. It also highlights the power of applying social collaborative concepts to innovation and points out how companies organized hierarchically are unable to adapt to this new way of doing things. So what are your key takeaways for you from this video? What would be your elevator pitch if you were trying to share the key concepts with an executive at a traditionally organized company? Study:Majority Use Social Media to ‘Vent’ About Customer Care. Are You Listening? An recent study commissioned by a Burlington, MA-based provider of voice-recognition solutions found that 72 percent of respondents used social media to research a company’s reputation for customer care before making a purchase, and 74 percent choose to do business with companies based on the customer care experiences shared by others online. The online study of 300 volunteer respondents doesn’t qualify as statistically accurate, but it is informative from a directional standpoint. 59 percent of the respondents said they regularly use social media to “vent” about their customer care frustrations. Readers of this blog know that I occasionally “vent” here and so do many others that I follow. Michael Arrington’s recent Comcast experience is a high-profile example which has received a fair amount of discussion in social media circles. If you haven’t heard the story, ends up with an executive at Comcast contacting Arrington because of a Twitter post that he had made about how frustrated he was with Comcast. Two thirds of the study’s respondents felt that companies don’t take online complaints seriously. Think about that for a minute. Empowered by the powerful online search capabilities, customers have grown accustomed to instant access to information and have developed increasingly high standards for customer service. They no longer need to be tied to a company. Add in Social Media, where the customer has a global voice and you now have citizen marketers who can potentially impact a company’s reputation for good or bad. Nick O’Neill over at Social Times recently asked if a large brand like Walmart could monitor all the comments made about them on Twitter and contact people that had a poor experience in their store. After measuring the volume of Tweets pertaining to Walmart at around one every half hour, O’Neill suggested that the answer is Yes. Of course, companies are skeptical about the need to participate in social media. How much of a difference will reaching out to a couple dozen irritated customers a day (most of whom are nowhere as influential as Arrington) make? I would have to say that today it’s probably not as impactful as many of us in the Social Media Echo Chamber would like to believe. 1. Open the door for your customer whenever possible. This is especially important if her hands are full. 2. Don’t just hand your customer his product, “present” it to him. 3. Keep the store temperature at a setting that is comfortable for customers. Most retailers set the thermostat at what’s comfortable for the employees. 4. Acknowledge your customer’s children. 5. Offer to gift-wrap purchases if you already know it is a gift. Don’t wait for your customer to ask. 6. Always suggest accessories and other items that will enhance a customer’s purchase and his/her life. 7. Offer to carry your customer’s purchase, however big or small, to her car. 12. Compliment your customer on his purchases. This is especially effective if he is another staff member’s customer. 13. Don’t give your customer too many choices. You’re the experts, so recommend a product based on what you learn from him/her. 14. Tell her why a product isn’t right for her. 15. If you can’t fulfill a customer’s need, suggest another company that may be able to do so. 21. Don’t interrupt the customer to talk. Talk – listen – talk – listen. You get the idea. 22. Do whatever you can – within reason – to keep an unhappy customer. What you’ll lose on the one transaction you’ll make it back because he will tell his friends and family how wonderful you are. 23. Refrain from visiting with a colleague when he/she is with a customer. It’s distracting to both the customer and the colleague. 30. Don’t coach or reprimand an employee or colleague in a customer’s presence. 31. If you’re on the phone with a customer and you absolutely must put him on hold, tell him approximately how long he will have to wait. 32. Don’t interrupt an employee with a customer unless it’s extremely important. 33. Create a children’s craft area in your store so the kids can create art while their parents shop. 36. Empathize with upset customers. Say you’re sorry. 44. If you’re busy and a customer is waiting for help, give him an estimate of how long he’ll have to wait for someone to help him. 45. Stop cleaning and doing busy work when customers are in the store. They’re less likely to ask for help if you’re doing other things. You can download the 50 Ways to Improve Your Customer’s Experience article that’s formated as a handout from Doug & Matt’s website . In February, I wrote part one of this series in conjunction the Re-Experiencing Starbucks project started by Becky Carroll and Jay Ehret. Over the next year, Becky and Jay are going to write a series of posts which analyze the current Starbucks experience, make suggestions for improvement, and then compare at the end of the year. Readers are invited to contribute with comments and suggestions. It’s been nearly two months since Starbucks closed all of their stores for a nationwide in-store education and training event and reopened promising to transform the customer experience with newly energized partners. I can only speak for my local stores, but I have not seen any difference. My grande sugar-free vanilla breve latte tastes pretty much like it always did, which is to say that it’s generally good, but with occasional inconsistencies, depending on which barista makes it. Ok, so perhaps the event was in fact a PR event. Starbucks certainly got lots of free publicity as a result. Last month at their annual meeting, Starbucks announced a laundry list of new initiatives designed to transform the customer experience including a new brewing and espresso machines, a rewards program and a new unique coffee blend (Pike Place Roast) which will be hand scooped and ground in store. Starbucks also took a page out of Dell’s playbook by launching MyStarbucksIdea.com. Like Dell’s Ideastorm, MyStarbucksIdea.com is an online community idea market where customers are encouraged to suggest and vote on ideas for improving the Starbucks experience. A team of 40 “Idea Partners” is responsible for reviewing, commenting on and consolidating the entries and for presenting “most popular and most innovative ideas that are the best fit for Starbucks” to key decision makers. I’m a big proponent of Open Innovation. Inviting your customers to help design the experience gives company insiders fantastic perspective on real customer needs and desires. It also goes a long way in helping to ensure that the ideas and innovations that are selected are ones that will resonate with customers. The reason most companies haven’t eagerly adopted an Open Innovation program is that it requires giving up control. If a company asks for feedback and customers speak loud and clear the brand needs to be prepared to act. If they don’t, they risk damaging the relationship with their most engaged customers. The good news is that Starbucks is asking customers to participate in the process. The bad news is that the site looks like a collection improvements that are already in the their marketing plan. The “Ideas in Action” section lists those ideas that are being taken forward. Almost every idea listed in this section is either something that Starbucks announced when they launched the site (Wi-Fi, Rewards, Pikes Peak Roast) or already had in test markets (Splash Sticks, Bite-sized pastries). Authenticity is what’s lacking. I applaud Starbucks taking the bold move of involving customers in conversations about the experience. They need to resist trying to control the conversation if they want to be seen as genuinely caring about what the customer has to say. It was billed as a weekend to remember and it clearly lived up to expectations. Over eighty marketing bloggers from all over the world jumped at the opportunity to go beyond the confines of their social media tools for one weekend and have face-to-face conversations with their peers. After months of planning, CK & Drew threw the most incredible party this past weekend in New York City. Social Media is all about building relationships. Those who don’t participate in Social Media sometimes have trouble understanding the real, meaningful relationships that can develop through Social Media interaction. Social Media removes the barrier of distance making it easy to connect and engage with like-minded people who share common ideals, interests and passions. From that interaction, virtual communities evolve to share ideas, offer support and encouragement, and to do good things. Meeting your digital friends in person is an unusual and somewhat surreal experience. You recognize them from the pictures they share on-line and you know some things about them from their writing. When they walk into the room, you get that “Hey, great to see you again” feeling, only you’ve never really seen them, spoken face to face, exchanged a handshake. Nevertheless, the conversations start up easily as if you are old friends. Prior to this weekend, I had experienced this only once before when I met three Valeria, Geoff & CC for dinner last fall. That meeting was wonderful, but with 80+ digital friends in attendance, Blogger Social was an emotionally overwhelming experience. Digital friendships can be can be very strong, but lack a sensory component. I can read a post, watch a video or listen to a podcast, but that just can’t compare with hugs, dinner conversation, silliness, jagerbombs, shared laughter, cigars, hearing a voice for the first time, karaoke at 4:00am……. Blogger Social was all that and so much more that it’s virtually impossible to adequately describe. Many others have tried this week and do it much better justice than I do so check out their posts. If you are a more visually-oriented person, check out the Blogger Social Flickr group. With 1300+ and still growing, that’s worth about 1.3 Million words, which is still not enough to really describe that Magic that was Blogger Social. Tomorrow morning, I head to New York City for Blogger Social ’08. A few months ago, I told the organizers, CK and Drew, that I would be happy to help them with some of the duties and was assigned the task of being in charge of event photography. We’re going be capturing images from all of the planned events, but also want have the “Socialites” capture pictures as they travel around the city for the many “meetups” that are being organized. Last week, we decided to print up little posters that feature the Blogger Social badge and give them to all the attendees so they can create some promotional shots around the city (hey, they’re marketers). On Sunday, I went to my local FedEx-Kinkos and shipped the posters to CK in NYC. They were supposed to arrive on Tuesday according to the clerk at my local store, but they didn’t. Checking the website, I saw that I dropped them off after the Sunday pickup. (Strike 1). On both Wednesday and Thursday, FedEx failed to deliver the package (recipient not home) even though I had specifically indicated on the shipment that signature was not required. I spoke to a Customer Service Agent on Wednesday evening who even placed a message into their system specifically instructing the driver to leave the package. (Strike 2). When it Absolutely, Positively Has to Get There? The posters absolutely, positively had to be there for tomorrow’s first event and I could not risk FedEx not leaving them again tomorrow, so I called the customer service line again to find out what happened and to find some resolution. The Customer Service Agent was pleasant, but unable to reach anyone at the depot to see about sending the package back out today. She did speak to a dispatcher who said it would be sent out again tomorrow. I complained that that would not be acceptable and was escalated to “Kelly”, a FedEx “Customer Advocate”. Kelly was very understanding and asked me to hold while she contacted the depot. When she subsequently connected me with “Cosmo” at the depot and dropped off the call, I assumed that she had already worked out a solution. I was very much surprised when Cosmo asked me how he could help and, after I explained the problem for the third time, was told that there was no one available to deliver the package until tomorrow. So much for having a “Customer Advocate”. (Strike 3, you’re out!). At this point I had no choice but to go to a local printer (UPS Store or Kinkos???) and get the posters reprinted and carry them with me to New York. I had done the originals at home, but I work out of town. To have them redone at a local printer was going to cost some money. Given their total ineptitude, I felt it only fair that Fedex-Kinkos pick up the tab. I called the Customer Service line again and managed to get back in touch with Kelly. She greeted me with “I guess Cosmo was not able to help?” to which I not so calmly affirmed “NO”. I then told kelly that I was going to go to a local FedEx-Kinkos to have the posters reprinted at their expense and I wanted to know how that would be arranged. That’s when Kelly informed me that they had no way to do that because the FedEx organization is separate from the Kinkos organization. It was at this point that I just about lost it. I told Kelly that I could care less about their internal organizational barriers. I shipped the package at a FedEx-Kinkos store and from the customer’s perspective, they were the same organization and needed to solve this problem. Kelly was then able to establish a conference call with someone from Kinko’s corporate office and I explained the problem once again. This time, Kelly remained on the line while the Kinko’s person explained that there was no way to credit me for the cost of the posters since they were not originally printed at Kinkos (I don’t think they really understood the problem). When I said that was unacceptable, she offered that I could take it up with the local store, but that it would be up to the discretion of the local Kinkos manager to reprint the posters at no charge. After some more discussion and insistence, Kelly instructed me to go to the store and then have the manager call her. At the Huntersville, NC store, I met Adam, the store manager, explained the problem (again) and put him in touch with Kelly. After a few minutes on the phone, he hung up and went to work printing my posters. The don’t have documented processes for dealing with Customer Experience problems like this. Their operational systems and procedures are ineffective (messages not received or read, customer’s instructions not followed). They operate as independent companies despite marketing themselves and an integrated organization. Those barriers need to be broken down when the get in the way of delivering a great experience. When you are shopping over the web, its very easy to compare prices through multiple browser tabs, but comparison shopping is not so easy to do in a brick & mortar store. Browsing e-commerce sites using most cell phone browsers is a painful experience. Text messaging on the other hand is a very easy task on most cell phones and for younger cell phone users, “texting” is the primary method of communication. With that as the backdrop, Amazon is once again showing that it “gets it” and in the process, has created a new competitive advantage against traditional retailers. TextBuyIt is an innovative new service which lets people text the name of a product, its description or its UPC or ISBN to 262966 (that’s “Amazon” on the keypad) from anywhere their cellphones work — including from inside physical stores. From there, the customers can check on order status on Amazon’s website. This is a clear “Make It Easy for Me” differentiator targeted squarely at younger, text-message-oriented consumers. It is also a wake up call for traditional retailers already impacted by the information empowered consumer. Your competitor is now actively competing with you inside your four walls.